I took a long time to compose my post, and was prompted by a house-number captcha. Easy. Then I was re-prompted to copy&paste some code into a text box ... but there's no way to submit that form! I click in the first text box (anywhere in the code), then do Ctrl+C. Then I click in the second text box, then do Ctrl-V. Enter simply inserts a newline, as expected = no submit. Ctrl+Enter does nothing. 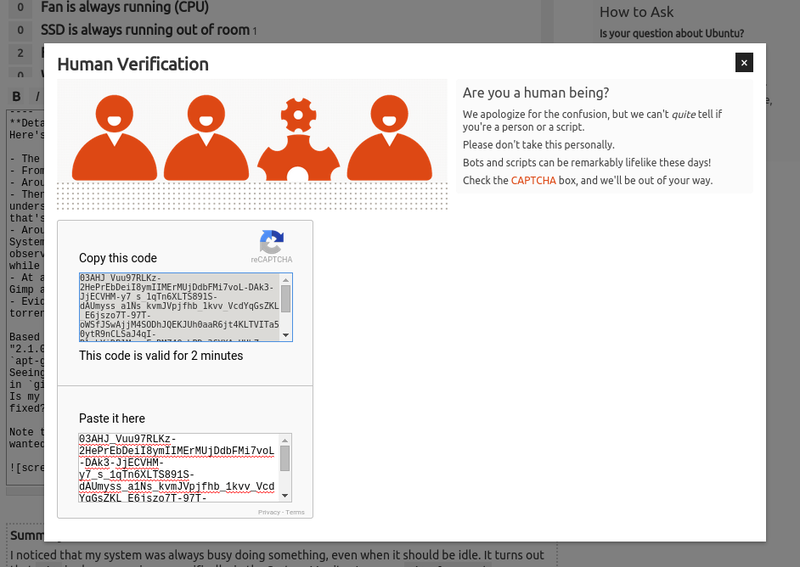 When I use the Tab key to find any clickable hyperlinks or buttons, all I get is the orange "CAPTCHA" link to the right. Upon retrying in a new browser window, I notice that the first captcha includes a suspiciously empty text box underneath the "Verify" button. It looks like the "Paste it here" text box in the screenshot, but without any label above it. "Privacy - Terms" appears below it. Browse other questions tagged bug captcha .